Polthaus Workshop: What? It's February Already? With temperatures plummeting into the single digits my unheated workshop sanctum sanctorum, the workshop has not been a pleasant place to hang out as of late. I have, however, managed to use up my spare time planning projects and helping my wife turn our spare room into a craft space. She is a graphic designer and her day job requires rather strict design guidelines, often leaving very little room for raw creativity. As a result, we discussed carving out some space of her own to paint, print, make jewelry, scrapbook, sew, and generally create (mostly so we can actually eat dinner on our dining room table again). Our extra bedroom is now officially her space, although, she did set some crayons, coloring paper and a tiny desk aside that she said I can share with our daughter. I did manage to accidentally teach myself some things about organization while setting up her room. I'll post on those ideas as I incorporate them into my workshop this year (if it ever thaws out). We treated the craft room as her birthday/Christmas present this year. I always feel a little bummed about combination presents (even when they are awesome), so I decided to make her some small tokens of my affection this year. I am not one for wearing jewelry, as anyone who knows me can attest. I am, on the other hand, fascinated by its creation. When cleaning out the spare room I came across a small box that contained a ring my wife bought me during a semester she spent in South America. 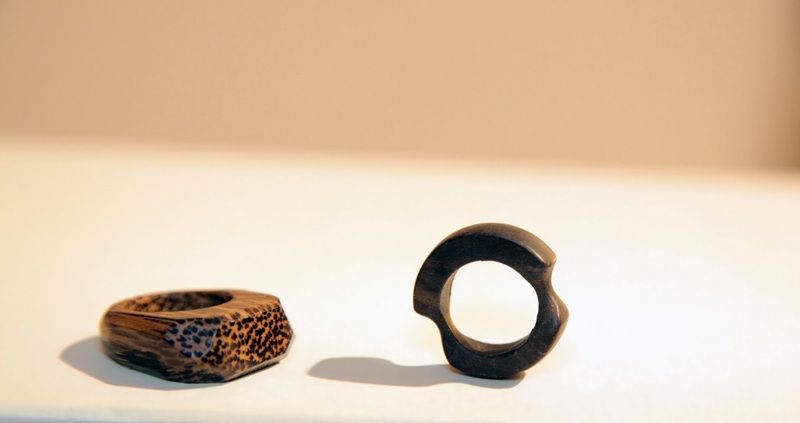 The ring is made of tagua nut, the nut from a tree commonly known as an ivory palm. It is a beautiful ring, but like every other piece of jewelry I own it has yet to be worn. The ring got me thinking though. 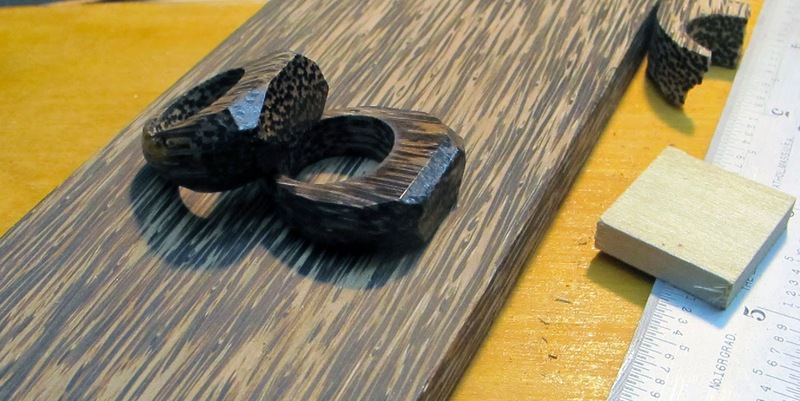 I have some rather dense, well cured exotic wood scraps in my workshop just waiting to be used for something cool, why not a ring? I used up the one warm day we have had lately to get out into the garage and saw up some black palm. By the way, black palm is a beautiful species. If you ever decide to use it for anything, be prepared for it to splinter into a million pieces, most of which will end up in your hands. First, I cut the black palm to size with a handsaw, my little Zona saw worked perfectly for this (it's an excellent $8 saw). I marked out a rough size for the ring with a compass. Next, I centered and drilled a hole for her finger. To size the hole, I "borrowed" one of her rings and matched forstner bits and paddle bits until I got a near match. When drilling out holes for these rings drill until the pointy nib pokes through the other side, flip the ring, use the hole to line up the nib, and drill through the other side. This avoids blowing out the opposite side and ruining some otherwise pristine beautiful wood. After drilling the hole, I sawed off as much of the excess as I could. I left the top flat as part of the design I had envisioned. I tried to drill the hole later in the process but found it was very difficult to hold, even with clamps, while drilling through the wood. 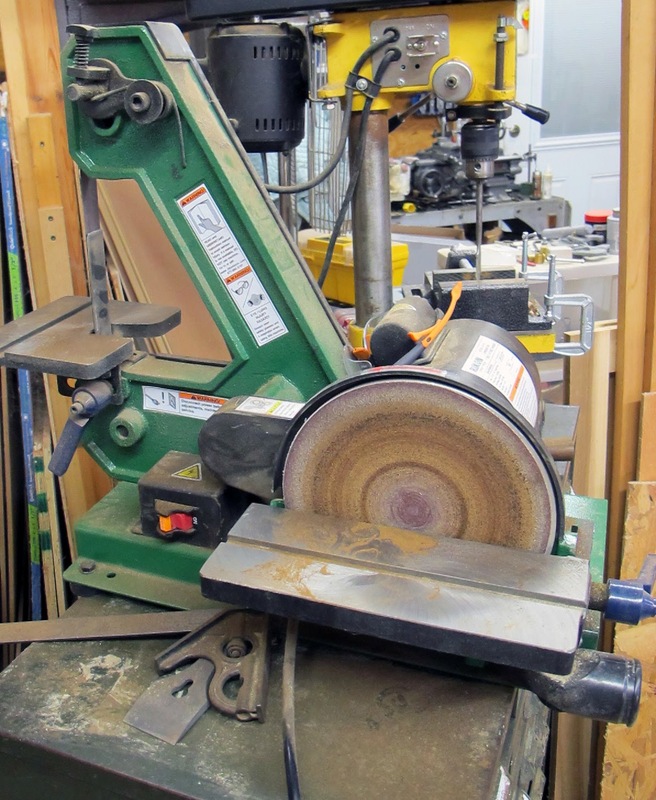 I then went to my disk/belt sander to shape the ring. I did all the shaping freehand on the disk sander and used the belt sander with a 220 grit belt to polish up the shape and facets. 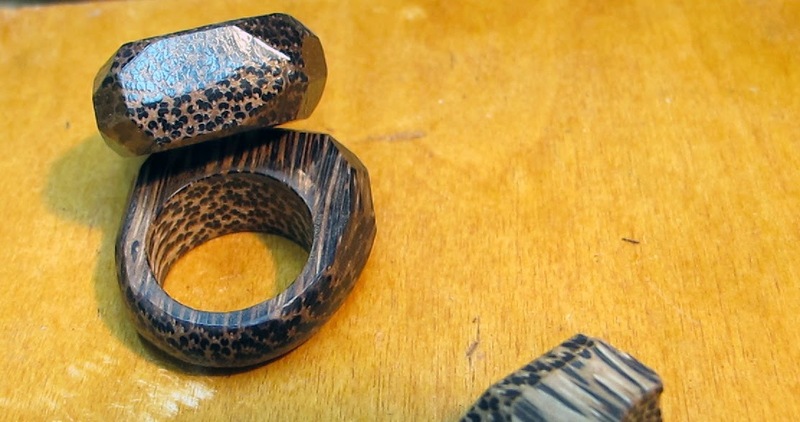 I faceted the flat top of the ring to expose as many different angles on the spectacular end grain the black palm has as possible. This entire process could also be done with sandpaper glued to a flat surface. 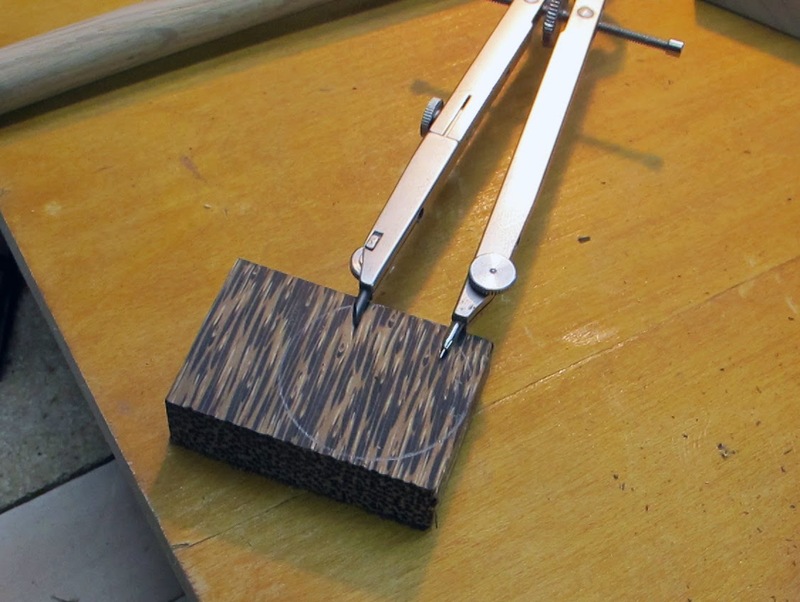 Just rub the ring on the sandpaper, it'll work a little slower but it will achieve the same results. 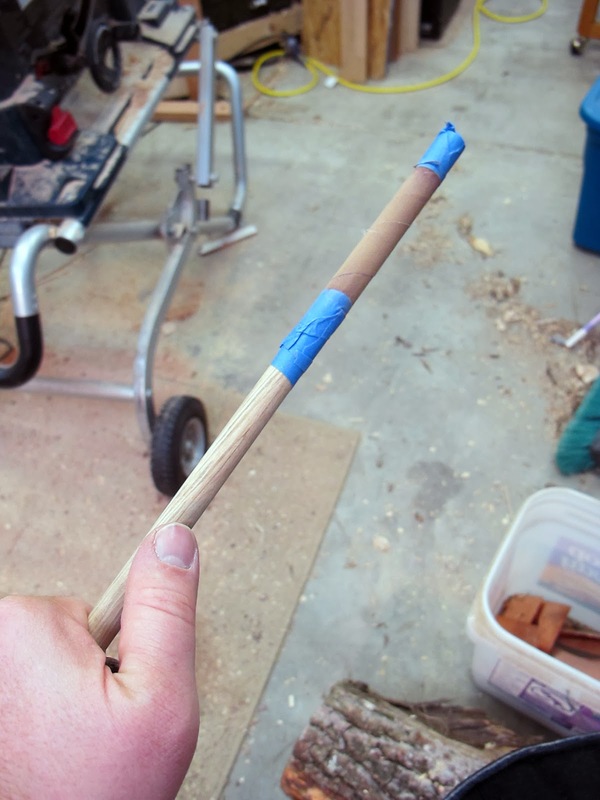 I sanded the finger hole inside the ring with a piece of sandpaper wrapped around a dowel. Next, in an attempt to clamp the ring in the vise while sanding it by hand, I proceeded to break it in half. 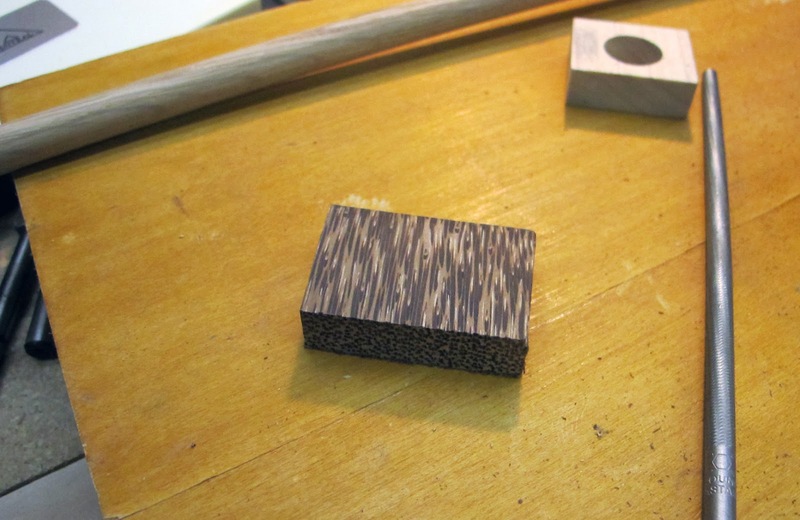 I'd recommend clamping across the grain (squish the grain together) rather than with the grain like I did, this will help prevent splitting when the fibers are compressed a little. After trying my hardest not to use profane language, I started over. 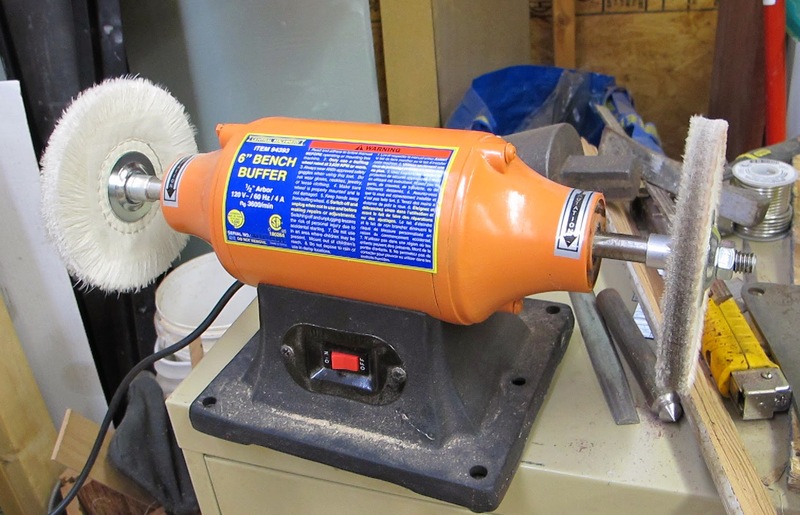 Once I had the rings sanded, I took them to my cheap-o ($30 at Horror Freight) bench buffer charged with plain old white polishing compound. This did a great job of giving the rings a little luster and shine. I finished the rings off with a touch of beeswax polish and handed them to my wife. 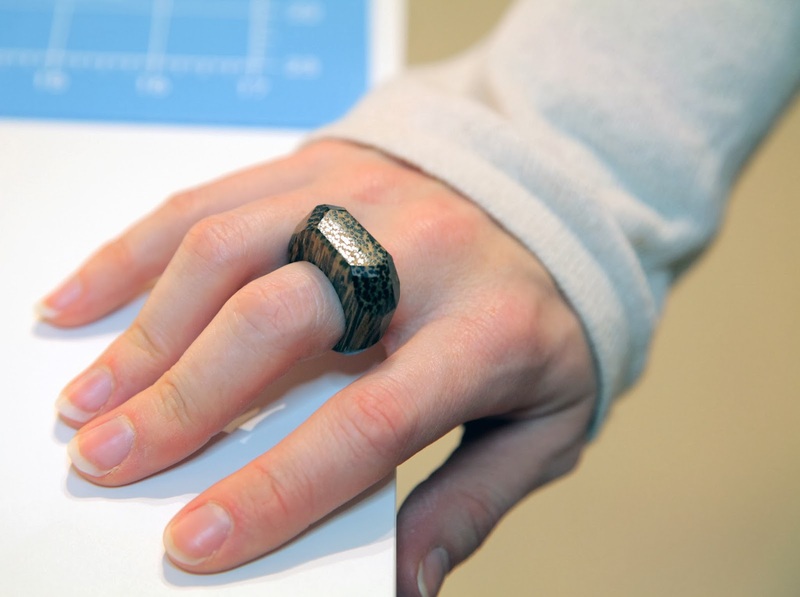 I followed up this design with a ring in ebony. 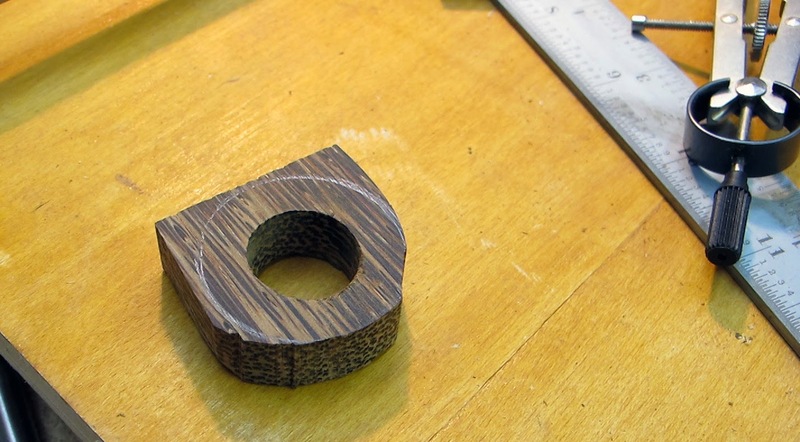 I used a slightly different construction method for the ebony ring which I'll post later as it's not yet complete. She loved these, and immediately gave me some design ideas for some others. I will get her into woodworking if it kills me! If you happen to be looking for a handmade gift for your loved one, try making one of these! Many larger sanders may contain a case add as a airborne dirt and dust collection technique. Most of these hand bags generally start a good employment having amassing the particular airborne dirt and dust but it will be good training to help have on a new airborne dirt and dust mask. Wow, I can't believe you did this freehand! I was quite unsure what it will end up with but it was so cool to find out you turned it into a ring.